Mt. Healthy Christian Church was formed in 1839, and met in the Free Meeting House until a church building was constructed in 1849. 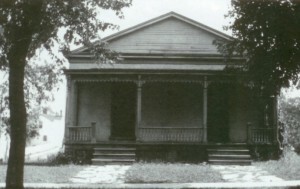 This first church building still stands, at 7718 Harrison Avenue. First building that housed the Mt. Healthy Christian Church, thought to have been built in 1849. Physician A.B. Luse, reputedly with abolitionist sympathies, was a member, and the known abolitionist Aaron Lane was one of three elders of the young church (see The Lane Family page on this website) . In January of 1854 the two other elders initiated the expulsion of elder Aaron Lane . As church historian D. Mylar Steffy describes in his blog post, (based upon original documents held in the church’s archives) “What Would David Burnet Have Said?”, the topic of abolition was not spoken outright, but local legend ever since that time has held that the precipitating issue was abolition: perhaps a desire for the church to take a stronger stance regarding slavery; perhaps the elder Lane was active in the Underground Railroad (as some stories assert) and some in the church felt this too risky. It appears though that Lane’s “offense” was something that everyone in the church was aware of. The abolitionist and temperance leader A.B. Luse (see Other Mt Healthy Abolitionists on this website), read a protest against the expulsion of Lane; it was signed by a good number of the church membership, who withdrew from the church. Aaron Lane died just weeks after an attempt at reconciliation was made by David Burnet, and the church remained split for the next five years. It is said that Lane’s son Isaac and his wife faithfully came to the steps of the church each Sunday during the schism. “We the undersigned members of the Christian Church in Mt. Healthy O. have observed with painful feelings the action of Geo. Catt and John Snodgrass, Elders or so called, in said Church, in which they have assumed to expel from the Church Elder Aaron Lane. We learn from the Holy Scriptures and the History of the Church that many things are and have been done in the name of God, that are not of God, and the injunction found in the instruction of the Elders, not to be Lords over God’s heritage, appears to intimate that such a thing might possibly occur. We therefore do not consider that the actions of any so called Elders, are of too high a character to be called in question when it is palpably plain, as in the instance under consideration, that they have transcended the bounds of their official authority and departed from the vital spirit and instruction of the law of God. In all the Religious Dispensations with which our heavenly Father has been pleased to favor the generations of men certain persons have been set aparte to the administration of the Church by the laying on of hands, the Bible is conclusive upon this point. The so called Elders Catt and Snodgrass never thus set aparte to their present office and were therefore incapable of proceeding as they have their action is therefore null and void and without a claim to our acquiescence. In all Equity from the highest parliament down through the various courts of Justice to the humblest in existence, in intellectual communities except within the bounds of Slavery and Popery, men charged with offences are allowed the privilege of self defence and are not in the onset required to prove a negative, those making the charges being first required to prove them true. The said so styled elders Catt and Snodgrass have assumed to Excommunicate Elder Lane from the Church without eather proving him guilty of any wrong or giving him a proper opportunity for self defence. We believe the action to be without correct premises and executed without reference to, or an observance of those principles of justice which distinguish the laws of both God and man, and hereby respectfully and solemnly inform the said so called Elders Catt and Snodgrass, that we will not abide by their decision or recognize it as in any way binding, or of any force on our parte.